Replace the Beaver Road Bridge over Gum Branch. Replacement of the KY 338 (Beaver Road) bridge over Gum Branch will improve structural issues and allow for widening of the bridge to accommodate wider shoulders and lanes. The bridge replacement project will eliminate the existing 28 ton weight restriction on the bridge and prevent future weight restrictions or closures. A new KY 338 bridge will improve the existing sufficiency rating. 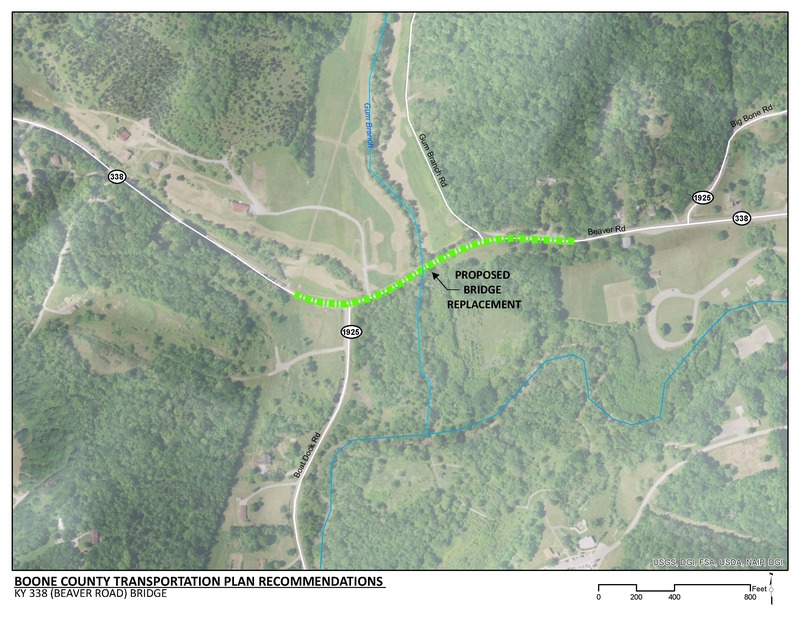 A bridge replacement project in this area will need to avoid or mitigate environmental impacts associated with the state conservation area and Big Bone Lick State Park. There are several overhead utilities that will be impacted by the bridge replacement project. There is a 28 ton weight limit on the bridge. This prevents western Boone County truck traffic from using this route to access the interstate. The KY 338 bridge runs along on the northern border of Big Bone Lick State Park. There is an identified state conservation area on either side of the bridge. The existing KY 338 bridge is characterized by 10-foot lanes with one-foot shoulders which do not meet the recommended width as presented in the “Policy on Geometric Design of Highways and Streets” by the American Association of State Highway Transportation Officials. These geometric deficiencies can create a safety issue for vehicles that travel on KY 338. The existing KY 338 bridge has a sufficiency rating of 53.5 out of 100 and is classified as functionally obsolete. The condition of both the substructure and deck are classified as Fair.